There's a Card for That: Happy Hoppy Day Series | Easter Tag Card, ft. 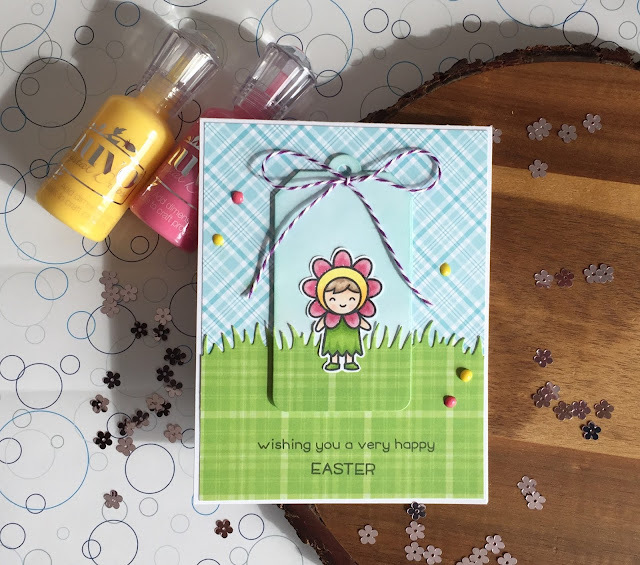 Lawn Fawn "Easter Party"
Happy Hoppy Day Series | Easter Tag Card, ft. Lawn Fawn "Easter Party"
Today I have an Easter Tag card featuring Lawn Fawn's "Easter Party" stamp set as well as some of their dies. No surprise, right? I swear I have other brands, but I'm just really on this Lawn Fawn kick and I can't seem to get off the wagon. I think they do it on purpose. I mean, how cute are these sets? No wonder I can't get enough! Check out the video above to see how I put this card together, as well as the complete list of Copic markers I used and which embellishments made it to this card! I used patterned paper from their Perfectly Plaid "Rainbow" and "Spring" collections - because I'm trying really, really hard to actually use the patterned paper I have been hoarding. I decided to put them out where I can see them which helps me remember to use them! And so far it's working out. I haven't gone all crazy yet, because the patterned paper still scares me. Coordination issues, I don't know. I didn't really do anything for the inside of the card because what can I say on the inside that I haven't said on the outside? When I looked at the thumbnail of your card, I didn't even realize there was a tag on it. Beautiful inking and design - such a wonderful card!